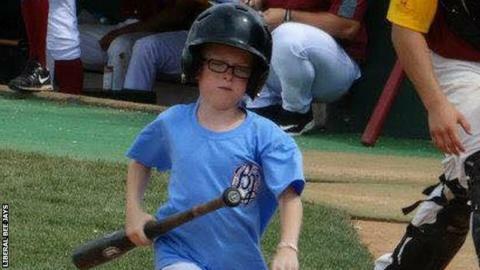 The National Baseball Congress has suspended the use of batboys and batgirls after the death of a nine-year-old boy. Kaiser Carlile, batboy for the Liberal Bee Jays, died on Sunday, a day after he was struck on the head by a warm-up swing during a match. Batboys are youngsters who pick up and organise equipment for teams' players. The NBC said it would not use batboys and batgirls in the rest of its World Series competition in Kansas. "We suspended the program for the rest of the tournament because of the situation that happened this weekend," Jason Ybarra, operations manager for the NBC Baseball Foundation, told USA Today Sports. The NBC World Series is a tournament for college-age amateur baseball players - it has five days left and eight teams remaining. Kaiser will be honoured by tournament organisers throughout the event and his father Chad Carlile said he had "no anger towards what has happened". "This is something that was obviously a tragedy," he said.